You can stream the lead single from Florence + The Machine's Ceremonials "Shake It Out" via YouTube while you wait for the commercial/digital single to be available in early October. We've now heard two songs from the upcoming sophomore release Ceremonials (three if you were lucky enough to hear "Strangeness & Charm performed like I was, although that song is only going to be available on the deluxe edition) and I'm so excited for this record I can hardly stand it. If somebody doesn't hurry up and announce a US release date -- the single is out Oct. 2, album Oct. 31 in the UK -- there's going to be some Lipton in the Tennessee River. Free Florence! "Shake It Up" is atmospheric, anthemic, and completely brilliant. There is tell of dragging around a horse and later and burying it. Florence doesn't strike me as being down with animal cruelty -- we've never met but I feel so close to her -- so I'm going out on a limb and assuming she's being metaphorical here. The burden shifts from a horse to a devil before the song's end. I haven't decoded all the lyrics so I'm not sure how that transition works and yet the theme is clear. I'm sure the harp solos we came to love on Lungs will surface on Ceremonials but it's not part of the sound of "Shake It Out." 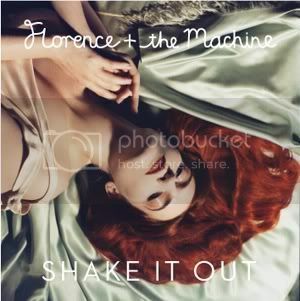 The song opens with organ and keyboard bathing Florence's beautiful voice before the big percussion kicks in. After that, "Shake It Out" explodes into a euphoric anthem. I can't get enough of this.